Home Page - Workers-Compensation-Law.us is dedicated to helping individuals with work-related injuries get the compensation they deserve. Click here now for help. Review of Workers' Compensation Insurance System - Learn about workers' compensation programs and how the process of filing a claim works. Injured? - Learn about whether your injury qualifies for workers' compensation. 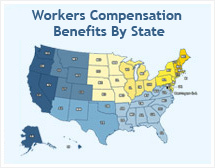 Apply for Workers' Compensation - Advice on how to successfully apply for workers' compensation. Applied. What Next? - Information on the steps to take after you've filed a workers' compensation report/claim. About Us - We have proudly provided the public with resources and connections to needed professional help for over 10 years.free of charge! Contact Us - Reach out to us for your workers' compensation claim concerns. FREE Workers' Compensation Claim Help - A direct link to a professional advocate or attorney to help you with your workers' compensation claim or appeal. FAQ's - Coming Soon! Questions and answers about your most common workers' compensation concerns. Do I Qualify? - Find out the important factors that determine if your injury qualifies you for workers' compensation payments. What Injuries are Covered? - The most common types of injuries that qualify for workers' compensation. How Long Must I Be Out Of Work? - Learn what length of time you are required to be out of work before receiving compensation. What If I'm A Federal Employee? - Are you a federal employee and want to know your rights? Permanent Disabilities - Is your injury considered a permanent disability? Defining "Permanent Disabilities" - How do workers' compensation insurance companies define a permanent disability? Calculating a Permanent Disability Benefit - What considerations are used to determine the amount of compensation you qualify for if you are permanently disabled through a job-related injury. How Do I File A Claim? - A review of the procedure for filing a workers' compensation injury claim. The Claims Process - A walk-through of the steps you will go through when filing a claim and being approved or rejected for workers' compensation. How Long Will It Take? - The length of time you must wait for your claim decision can put your family at financial risk. A representative can shorten your wait. What Are The Benefits of Hiring An Attorney? - Considering representing yourself throughout the workers' compensation process? This information will show you the benefits of hiring representation. Workers' Compensation Benefits - This article outlines the four main types of benefits and the different classification levels of disability. Who Decides If I Qualify? - Does the insurance company have the final say in your workers' compensation claim? What Benefits Will I Receive? - Learn how the extent of your injury will determine your benefit level. How Long Do Benefits Last? - If you're approved, learn what will terminate your compensation. Medical Examinations - What will make or break the approval of your workers' compensation claim. Am I Required To See A Doctor? - Don't consider filing a workers' compensation claim without a doctor's evidence of injury. Do I Have To See My Company's Doctor? - Don't want to be examined by your company's doctor? Learn the requirements. What is the Doctor's Role? - How important is your doctor's report to your determination of benefits. Concerns About Employers - Head of problems with your employer before the stall your workers' compensation claim. What If My Employer Doesn't Have Insurance? - Learn the rule of the law, and what to do if your employer breaks it. What If My Employer Tells Me Not To File A Claim? - Employer retaliation is illegal, find out more. Can I Sue My Employer In Court? - Workers' compensation insurance protects both employer and employee, but there are situations where you can file suit. Returning to Work - What are the rules for returning to work after a job-related injury? Who Determines If I Can Work Again? - Who has the last-say in when it's time to go back to work? Can I Be Forced to Return to Work? - What you should do if you feel that you aren't ready to work. What If I Can't Do My Previous Job? - Learn your options for if you're unable to do your previous job. Social Security Disability Help - Have you been denied your claim for social security or need help making an initial application? Get the help you need. Veteran's Benefits Help - Veterans are eligible for specific government benefits such as education, health care, life insurance, home loans and more. ERISA Disability Help - Have you been the victim of "bad faith" on the act of a private insurance company? National Attorney Directory - Select your state to connect with a professional advocate or attorney that can assist you in your region. Refer A Friend - We can help someone you care about get the benefits that they need. Legal Disclaimer - Information is provided on the terms and conditions of this workers' compensation legal help site. Report a Problem with the Site - Found a problem while visiting Workers-Compensation-Law.us? Please let us know about it. Company Information - Whether you are filing a workers' compensation claim for the first time, appealing a denial, or needing information on your rights. Our mission is to get you the help and benefits that you need. Additional Social Security Resources - We've worked to provide you with resources to make the process of filing a claim for workers' compensation benefits less of a headache. Get informed here.